Benefit to be for Ryan Hemenway family. Friends and family, along with the community of Elgin, have joined together to help a young father with medical needs. 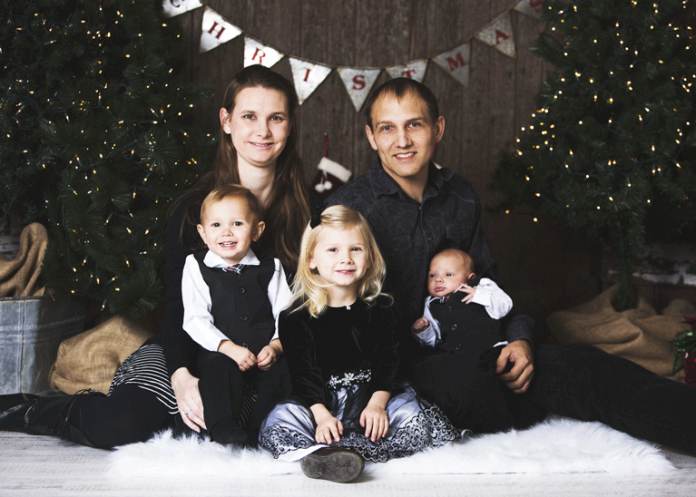 Ryan Hemenway of rural Elgin was diagnosed with Stage 2 Bulky Hodgkin’s Lymphoma in September of 2017. Ryan and his wife Tiffany (Meyer) are the parents of three young children: Hannah, John and Christopher (born November 7, 2017). 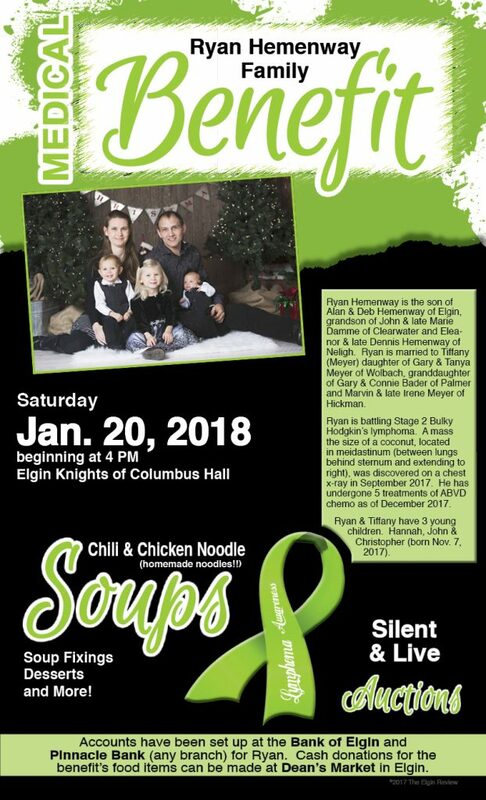 A medical benefit for the family will be held on Saturday, January 20, 2018 at the Elgin Knights of Columbus Hall, Elgin, Nebraska. Beginning at 4 pm, the evening will feature homemade chili and chicken noodle soups (mom Deb Hemenway is making her famous homemade noodles for the soup! ), sides, desserts and refreshments. The night will also have silent and live auctions. Accounts for those unable to attend but still wishing to help the family have been set up at the Bank of Elgin and Pinnacle Bank (at any branch). A chest x-ray uncovered a mass the size of a coconut (12 cm by 16 cm) located in the mediastinum (behind the sternum, between the lungs and extending to the right). Since the diagnosis, Ryan has undergone 5 treatments of ABVD chemo, the most recent one in December. A second PET scan performed recently showed that the tumor has shrunk down to 10 cm, news that the family is very thankful to hear. According to his wife Tiffany, their life has had its challenges in the past year. “It has been a long year for us with many ups and downs. Our son Christopher was born November 7, 2017. I am looking forward to 2018 where, hopefully, Ryan will feel like being more involved and want to attend more family and community functions”. Ryan is a 2004 graduate of Elgin High School. His parents are Alan and Deb Hemenway of Elgin. He is the grandson of John and the late Marie Damme of Clearwater and Eleanor and the late Dennis Hemenway of Neligh. Tiffany (Meyer) is the daughter of Gary and Tanya Meyer of Wolbach and the granddaughter of Gary and Connie Bader of Palmer and Marvin and the late Irene Meyer of Hickman.